Peaceful Acres Lavender Farm has completed the Ohio Earthship Project. Earthship homes are an alternative structure designed by Michael Reynolds of Earthship Biotecture. These structures utilize used car tires to form a steel belted rubber encased brick filled with an earth mass. These Eco Friendly Homes incorporate aluminium cans and glass beer & wine bottles were used as bricks replacing traditional home brick laying materials. There is an estimated 600,000 lbs of clay dirt, sand, gravel and mortar used in this eco friendly home. The Earthship structure has over 400 cases (rounded down) of beer bottles, 200 cases of aluminium cans and near 100 cases of coloured wine bottles. This earth home has a square footage at 2000s' with two restrooms, three bedrooms, kitchen, utility room, living room and a family room. This earthship was built as a single family ranch layout. The interior support beams were harvested from a 10 acre wood lot then saw milled on-site with a portable sawmill. The interior hardwood walnut cabinetry lumber was harvested here on the farm. The logs were sawmilled by T.A. Weaver Lumber in Bainbridge, Ohio. T.A. Weaver lumber is an Amish sawmill specializing in true grade#A, Southeren White Pine log homes lumber. All 2900 board foot of interior tounge and groove white pine was supplied by T.A Weaver Lumber. The quality was much better than our commercial box store lumber. The wood is so much easier to stain and work with with less than 5% damaged lumber, without picking board by board. Interior plastering consist of sifted clay dirt, natural creak sand, and straw at a consistent mix of 3/2. This equals our to 3 natural sand, 2 sifted clay soil (not top soil) and a singe wafer of straw whipped to needles in a hay stack. Mixing all three of these components creates a very strong plaster mix. The roof square footage will feed a 5000 gallon cistern which will be filtered through carbon filters and an ionizer water treatment system. Sewage treatment will be a traditional leach field septic system. The complications to introduce a new sewage treatment plan is not suitable for us at this time. The home will utilize solar and wind turbine power attached to the grid feeding the Electric company. The power will be repurchased through our electric equity and we will be storing a charged battery supply for power outages reducing wear on the battery cells. Temperature fluctuation will be monitored daily throughout the year to gain an average year round temperature through seasonal changes.sources to reduce the need for traditional utilities. These methods of producing electricity will allow us to feed the power company rather than pay a monthly payment to them. This Eco Friendly Home has been a long work in progress for our family. The home project started summer 2008 with the first row of packed tires. Images are available at the bottom of this website titled, 'First Phase'. Up until November 2014 the structure had it's share of complications from the building department and EPA. 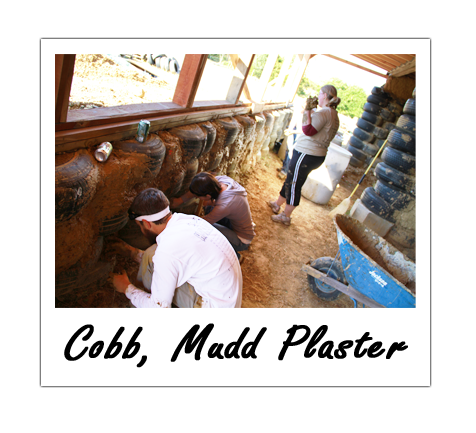 Each department worked with us to accomplish the dream of living in an earthship home. Packing a car tire for an Earthship build is an easy cheap building method for a foundation however it can be a tough project to accomplish. One tire should take less than 30 minutes to completely pack full with a sledge hammer or pneumatic tamper. First, place the tire in the perminent location. This will be the final location of a packed tire full of clay dirt forming a round steel belted rubber encased brick. Keep in mind the tire will weigh 350lbs. once complete. Continue the same basic tire packing procedures as explained using the eight position packing pattern. After the second tire has been completely packed and levelled to the desired height at nine and a half inches and levelled across from tire to tire, you now have a foundation being formed. Continue the same tire packing method throughout the entire first foundation row following the brick pattern and continue on. The second row of tires begin with the first empty tire positioned over the first and second packed tires that were packed during the first row. This second row tire should be placed above the split of tire on tire one and two of the first row. From this point on, the tire will always be positioned over two tires row after row. It is very important to not forget the cardboard or carpet lining inside the bottom of each and every tire. This will keep the fill dirt from falling through the bottom of the tire during packing a tire. Continue the tire packing steps throughout each row. One tire packs up to 9.5 inches, so you can determine how many tire rows will be needed by the height the foundation was designed at. Example: A 10 foot ceiling height will require 13 rows of tires, which will result in a little higher foundation at 123.5 inches. Now begins the actual preliminary procedures to organize the build towards a tire foundation. Not limited to one feature, these tires can also be used to build retaining walls, garden beds, wash ways, planters and many other uses. Dependant on EPA approval utilizing over 10 tires. Locating a mass deposit of tires is fairly easy in the United States. Every city, from small rural towns to major metropolises very likely have a tire shop. These tire shops are responsible for properly disposing of used tires while charging the consumer a disposal fee which normally runs $4 per tire. What I have accomplished is reduced the overhead for the tire shop while building a relationship which has helped the end cost towards ongoing automotive repairs. What a great deal to receive free building materials (tires) and cheaper labor rates while building a home, subject to relationship established. The square footage of our current Earthship Project is 2000 square foot, utilizing 1400 car tires. Ohio burns 47,000 tires a day in our state. If better utilized, Ohioans could build 58-1100 sq' homes a day in this great state. Imagine the reduced emissions with the sustainability of an Earthship structure. What a better way to build! First of all my name is Abraham and I live about 30 miles east of EL Paso Texas. I watched your videos and I thought they were the most informative from the whole bunch I have watched. I had several questions I was wondering if you would have time to advise me on. I am planning to build a earthship home about the same style you were building yours, but I still feel short on some of the information I think I should know before starting, I checked on other websites but they don't talk much about it. is there a foundation on the structure? or is is built right on the ground? do you put the cardboard to all the tires or just specific ones? did you fill the holes with cans and mud? do you have picture of how you added the roof? what type of insulation did you use? Q 1. is there a foundation on the structure? or is is built right on the ground? Yes, there is a foundation constructed of earth-rammed tires. These tires weigh between 300-350lb each. This tire foundation, which weighs nearly 400,000 lbs., floats on the earth, thus giving the alternative home the name "Earthship" . No footer is poured for the foundation to set on. Most newer Earthship designs pour a solid concrete footer on top of the tire foundation. Tires all all filled with dirt, small rock, and sand, any hard material that won't decompose. Results from our own research have found that utilizing carpet on the inside of tires rather than cardboard before filling with dirt will add to the structural stability of these tire blocks. This would make these indestructible bricks. Cardboard can get wet and crumbles as it dries out, causing blow outs in tires. In blow outs we experienced, we found that air pockets that formed as a result can be filled with a mortar cement mix. Q 3. do you put the cardboard to all the tires or just specific ones? Card board is added to the bottom of ALL tires or the dirt would not stay in the tire during packing. I do recommend using old carpet instead to avoid possible break down if the card board were to get wet. Q. 4. did you fill the holes with cans and mud? No. Cans are only used for building mortared walls and filler between the voids of the tire wall after they are packed solid, not for inside the tire. You also want to use dry material when packing tires. The wetter the tire amendments the more they have a chance of drying out and shrinking. This could cause moderate to severe foundation changes. It is extremely hard to find dry dirt so turning soil and covering to keep dry during wet periods does help. Q 5. do you have picture of how you added the roof? Yes, this page should display construction images. Q 6. what type of insulation did you use? I used Rigid R39 4'x8'x4" thick board doubled up to 8" thick on top of 1" deck boards. 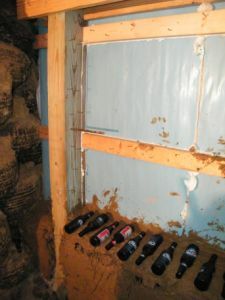 The walls use 13" thick beer bottled structure with 2" board on the outside with 1/2" OSB on the outer. Then we'll mortar the entries outside over the.